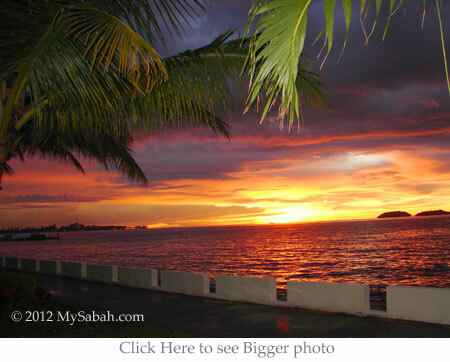 Huffington Post says Sabah has one of the best sunset in the world. I guess there might be a few reasons. 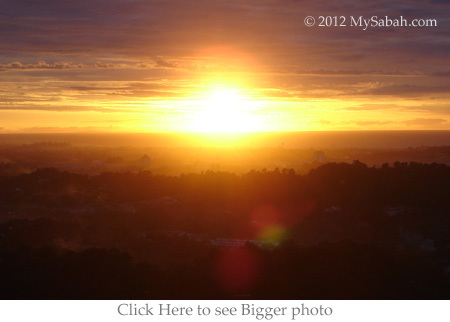 The sun looks bigger near equator. Our air is clean for better clarity of sunset view. 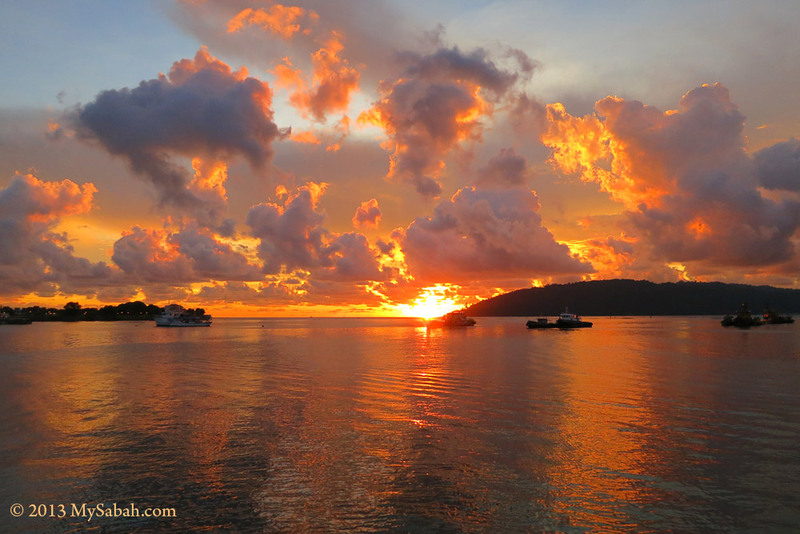 The high humidity and dense cloud of our tropical climate also help to paint a more colorful and magnificent sky for sunset. 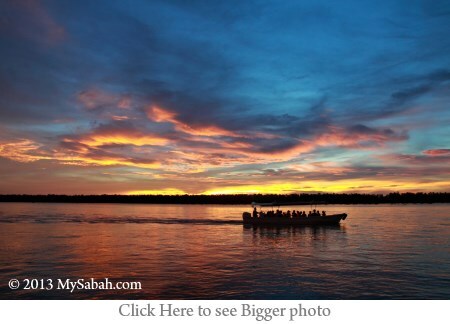 Below are 10 best places to see sunset in Sabah. I had personally visited all these locations. 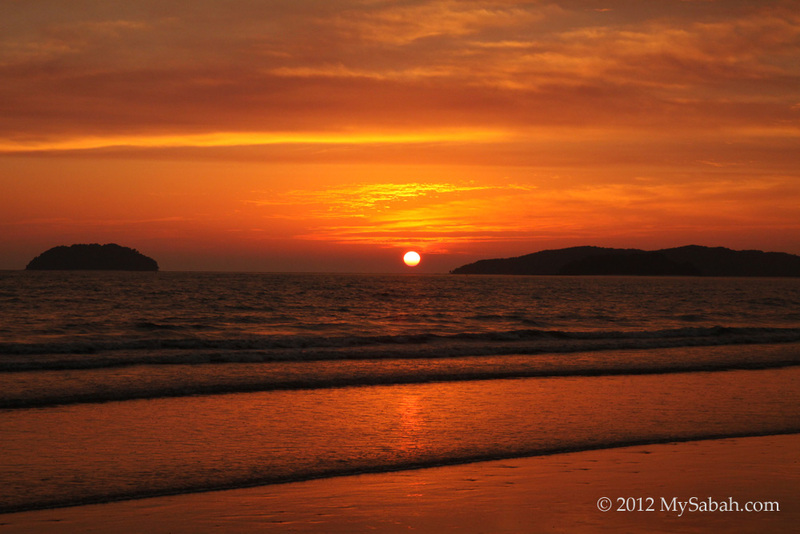 However, you need a bit of luck for seeing a beautiful sunset in good weather. 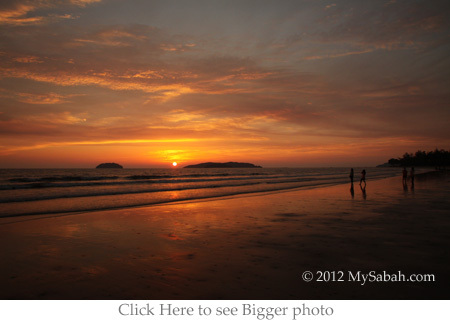 Only 2 KM from Kota Kinabalu city (KK), Sutera Harbor is highly accessible and it is next to 5-star Sutera Harbour Resort. Unlike the bustling and noisy city, Sutera Harbor is a clean and quiet place for holiday, providing a better ambiance to appreciate sunset. I rank Sutera Harbor as number 10 because its surrounding man-made structures don’t blend well into nature. I love the port view anyway. 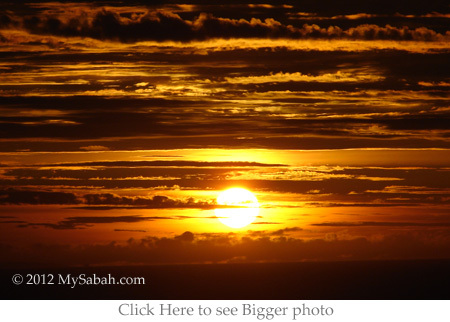 You need to workout a bit to earn the breath-taking view of sunset on top of Bukit Padang. 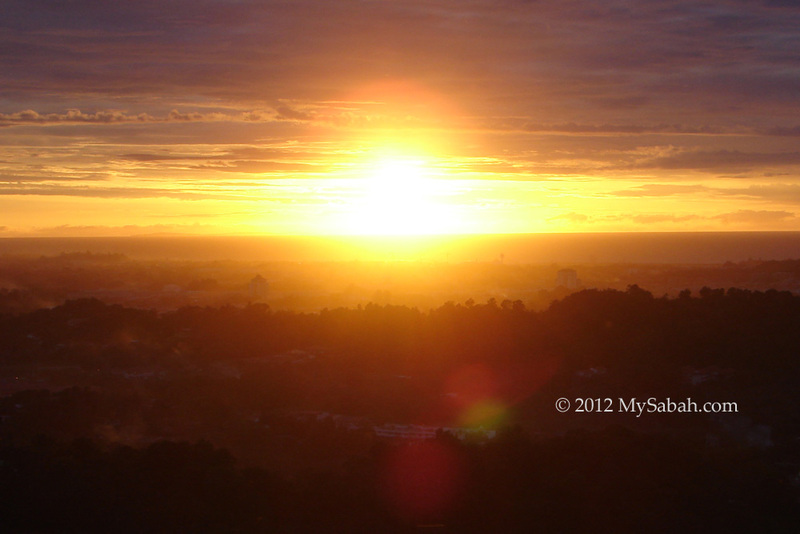 Bukit Padang is a small hill in the most famous jogging park of KK, Tun Fuad Stephens Park. Near the start of jogging track around Kampung Nelayan Seafood Restaurant, there is a nature trail that leads you to the top of Bukit Padang. The uphill trail is a good training site for people who want to climb Mt. 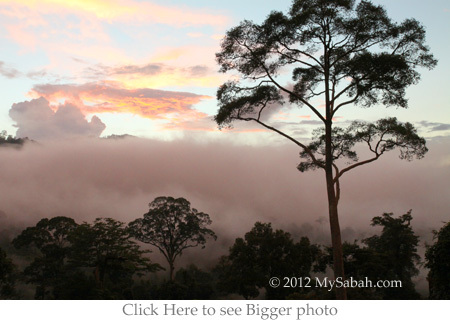 Kinabalu. You can see many people here during weekends. Just follow them, walk slowly and you will reach the top in 30 minutes. 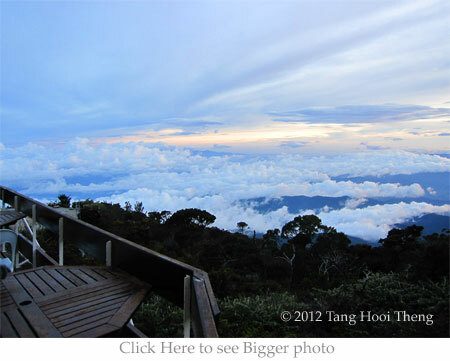 On top of Bukit Padang, you will have a bird-eye view of KK and the South China Sea. Please note that there is no street light on the nature trail. 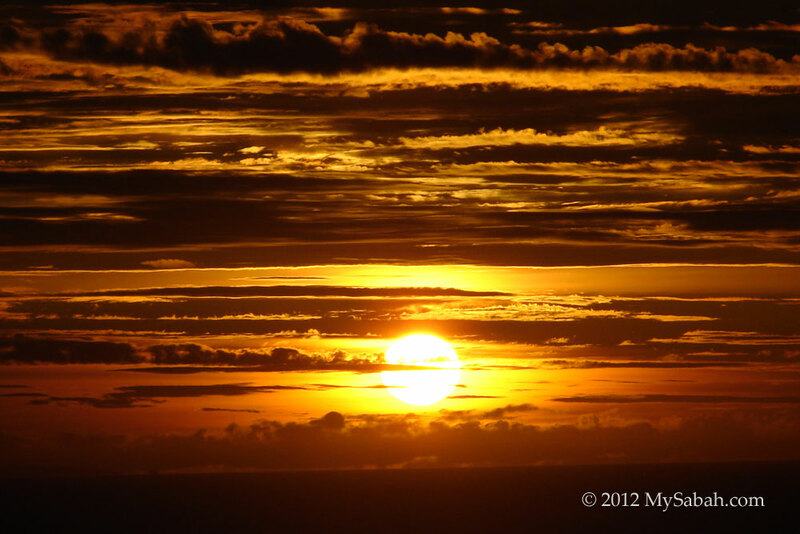 You better bring a torchlight if you plan to see sunset and leave in the dark. 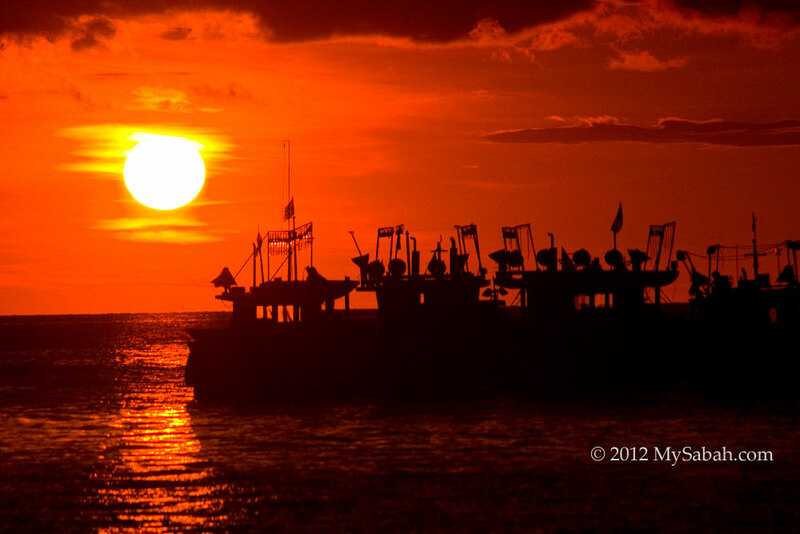 Some may ask, “Just sunset no beer?” Ok, you may think beautiful sunset should go with beer, then Waterfront is for you. 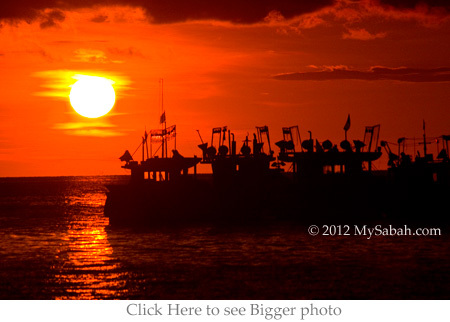 Waterfront is in the heart of KK and a famous Food & Beverage and Night-life center. 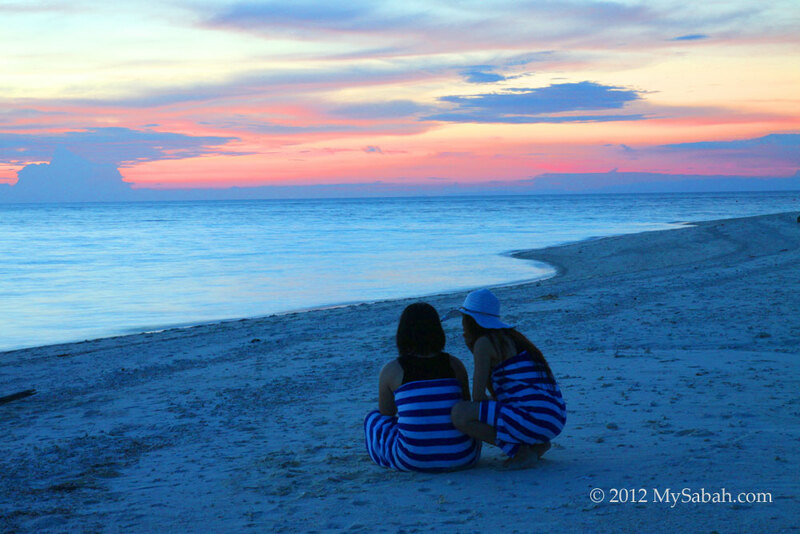 When sunset approaches, many tourists and locals congregate on the wooden open space platform facing the sea. There are plenty of choices for food and drink, for example, seafood, cocktail, BBQ lamb, beer, steak, chicken wing, fruit juice, western and Asian food, you name it. 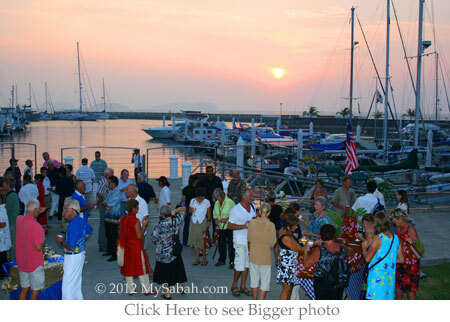 After enjoying the sunset and sea breeze, you can continue your party in pubs and night entertainment centers nearby. 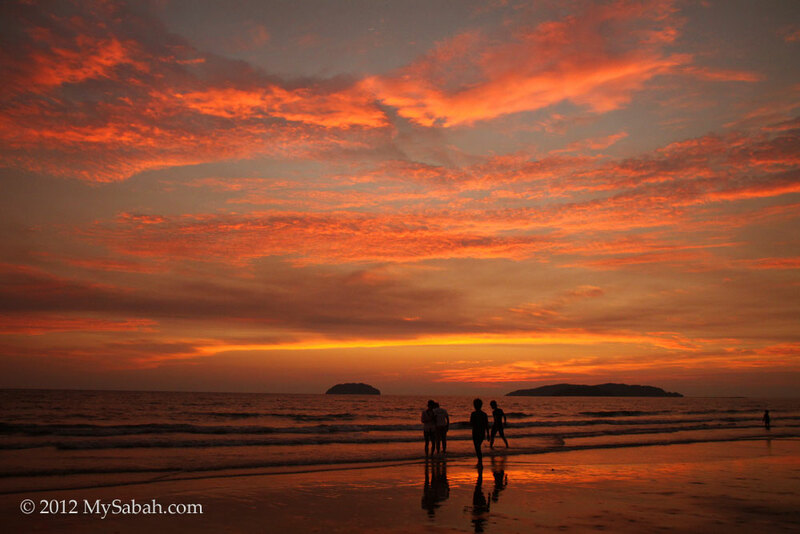 If you ask our locals for nice place to see sunset, 99 out of 100 will say Tanjung Aru Beach. 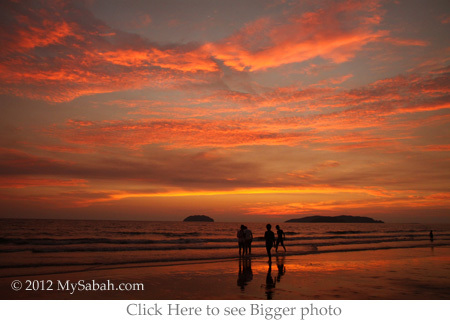 To KK folks, Tanjung Aru Beach holds an important place in their memories. Many build their first sand castle or bring their first love here. Most come there for the sunset. 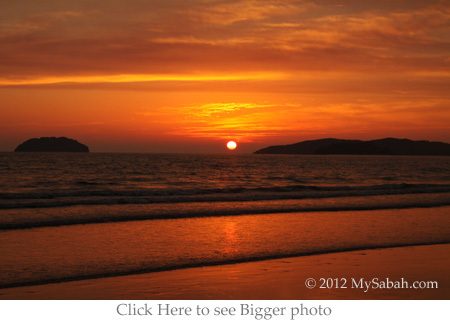 There are some restaurants along the beach so you can dine with the big egg yolk (sunset). Or you can enjoy a cocktail at the Sunset Bar of Shangri-La’s Tanjung Aru Resort only a KM away. 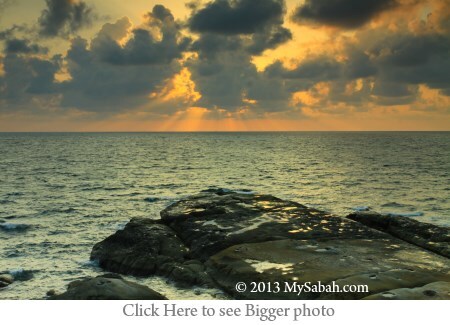 You can see Sulug and Manukan Islands on South China Sea. After the sunset, you may walk about 200 Meters to Perdana Park nearby to watch Musical Fountain, which starts at 7pm, 7:30pm, 8pm and 8:30pm daily. 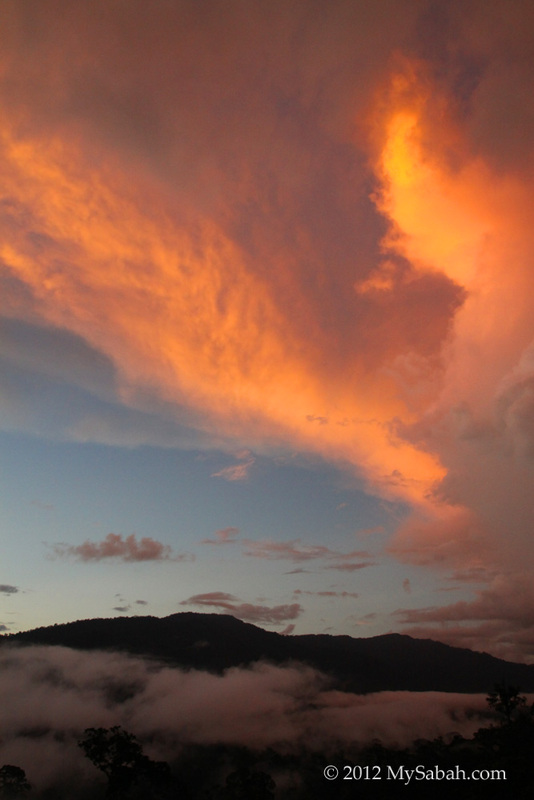 Above: the famous “fire cloud”, which looks like burning cloud. 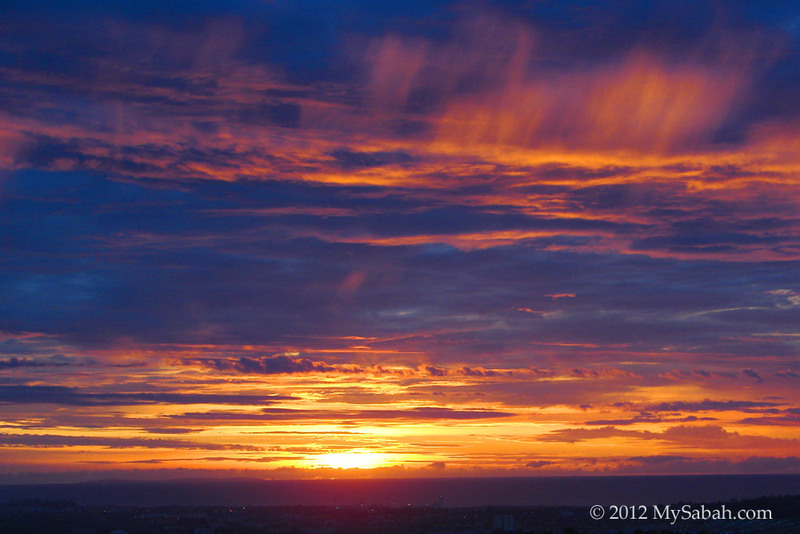 It usually displays in full intensity a few minutes after the sunset. 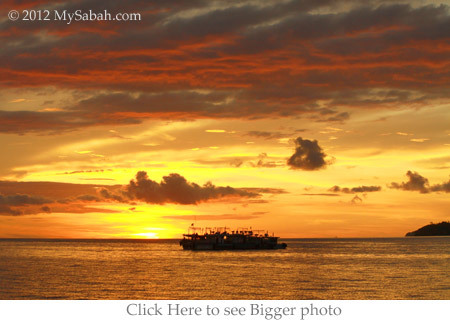 Pom-Pom Island is one of the islands of Semporna at east coast of Sabah. Tourists love to spend a holiday in their water bungalow. 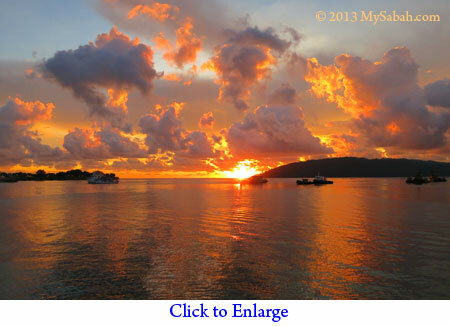 Pom-Pom is facing Bohey Dulang island at west side. 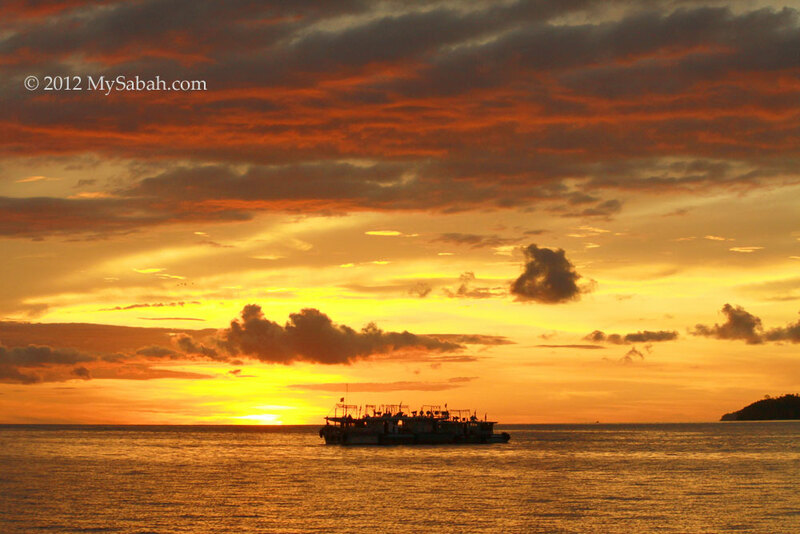 You can see sunset of Bohey Dulang island from Pom-Pom Island. 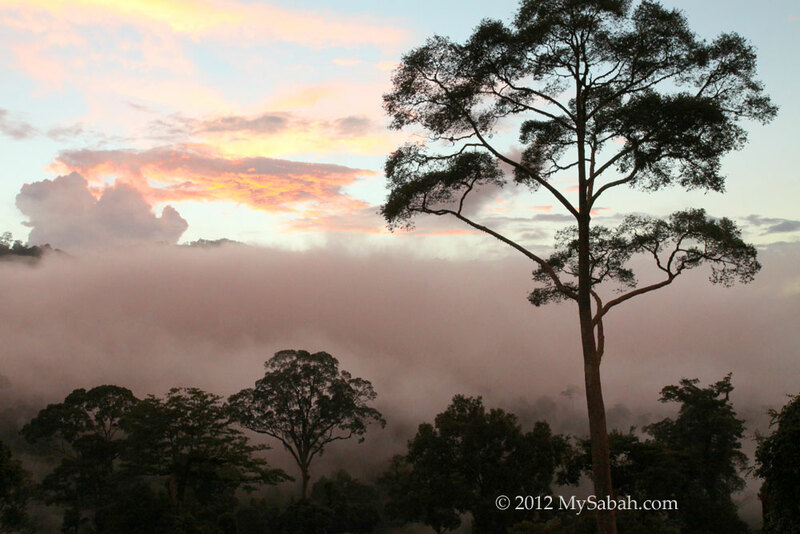 Legend says there is a beautiful Suluk princess, named Arung Salamiah, hiding on Bohey Dulang. There is no resident, except resort guests, on Pom-Pom. 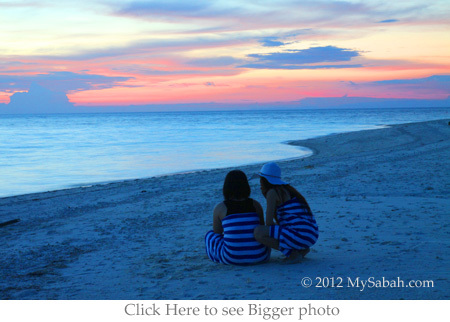 The whole sandy white beach and sunset of Celebes Sea are totally yours. 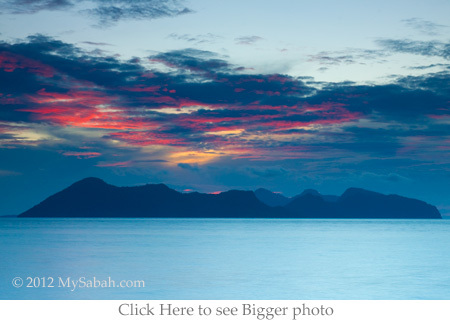 Located on the northern-most tip of Borneo, the third largest island in the world, Tip of Borneo is the meeting point of two vast oceans, namely, South China Sea and Sulu Sea. 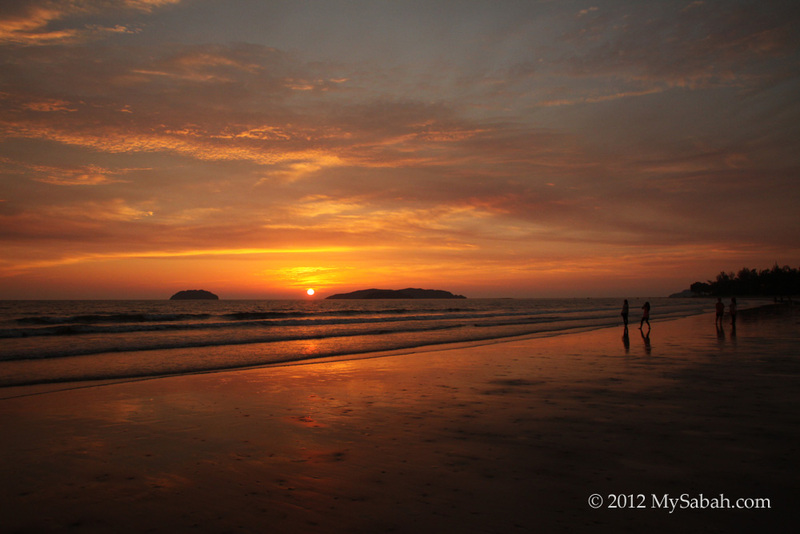 Tip of Borneo is frequented by tourists even during daytime, due to its scenic beach and countryside. 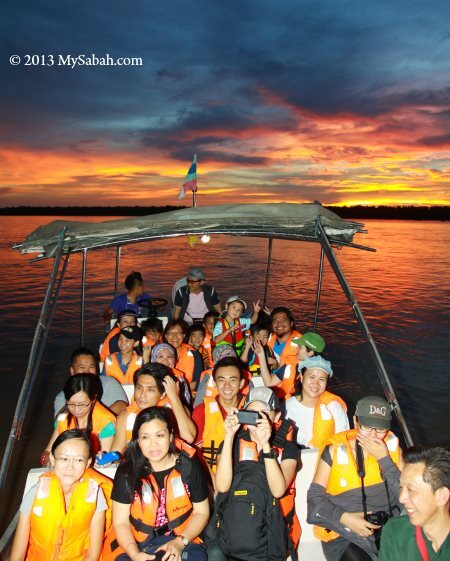 However, when most tourists leave before dark, it’s the time The Tip of Borneo shows her true beauty to those who are keen to stay put. 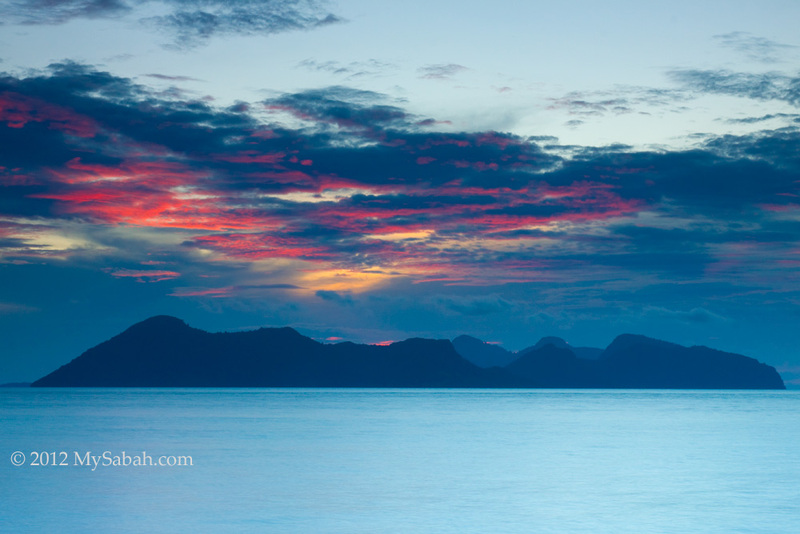 When the sun sinks, the ultra wide sea horizon becomes an infinite stage for the rich colors of sunset, extending over the edges of your eyesight. 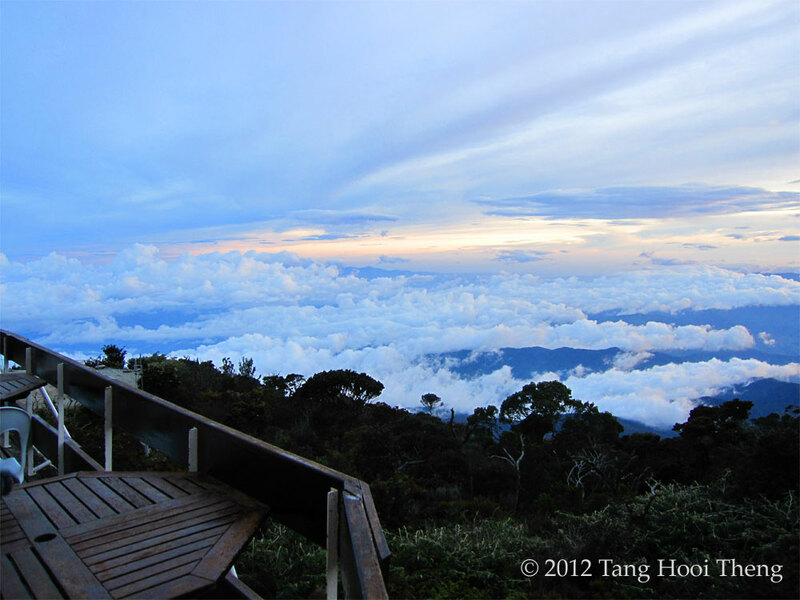 To see how nature goes to sleep, you must visit Maliau Rim Observation Tower of Maliau Basin, in the middle of Sabah. In contrast to tranquility of sunset, the sunset in this pristine forest reserve is accompanied by numerous bird chirping and animal calls around you. 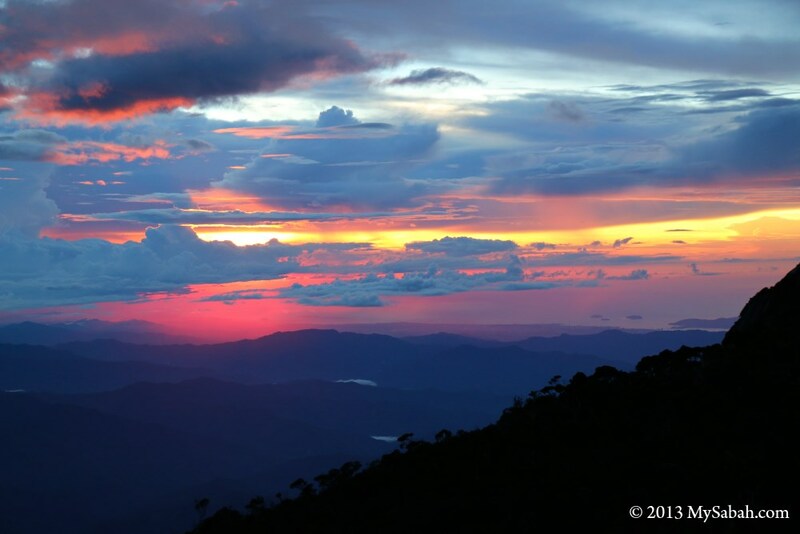 Due to deforestation, such lively rainforest sunset is very rare nowadays. At the end of the sunset, thick mist covers the forest, like Mother Earth putting a blanket over her land before bedtime. 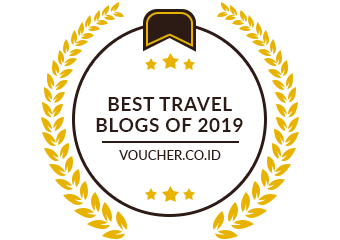 I want to rank Maliau Basin as the BEST sunset site, but its accessibility is poor, you need to drive more than 200 KM on 4-wheel drive to reach this place. 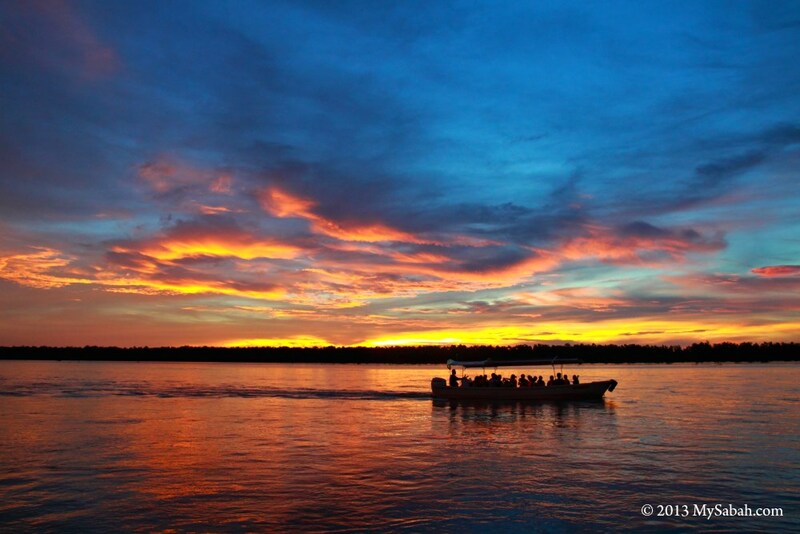 Weston River is a popular river cruise destination for sighting of firefly and long-nosed monkey. However, it is something else that catches the heart of tourists. After visiting Weston, almost every tourists will post the sunset photos on their Facebook and Instagram, because it is so breathtaking! The colors of sunset in Weston is so intense that you can even capture it with low-end phone camera. The sky is painted red and yellow, and these colors are also reflected on the big Weston River. 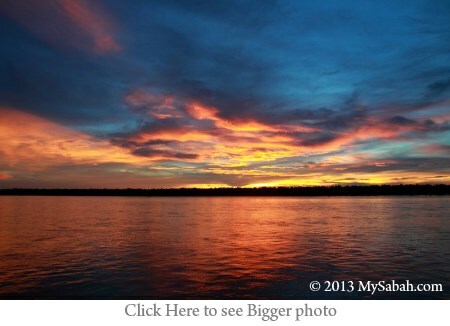 It’s a sunset with sky, river and trees as canvas, no wonder everyone is crazy about it. 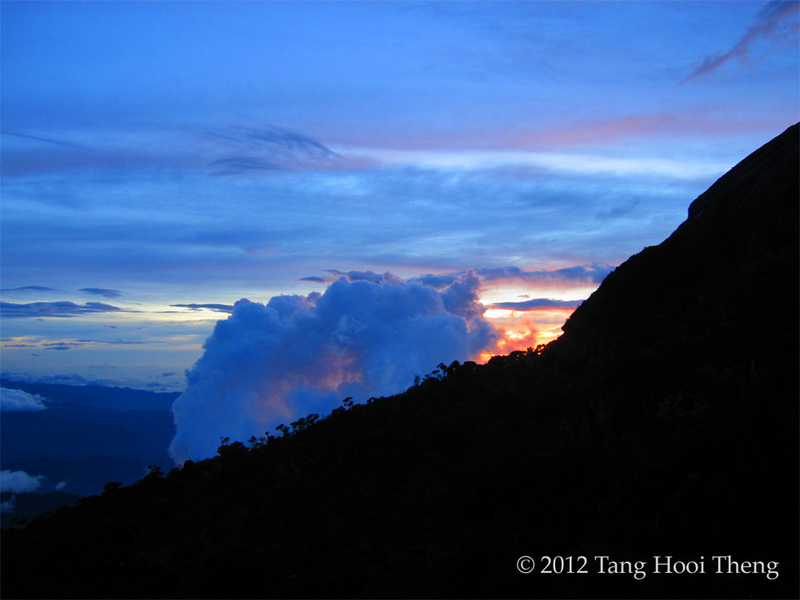 Laban Rata is the mid-way accommodation for climbers of Mt. 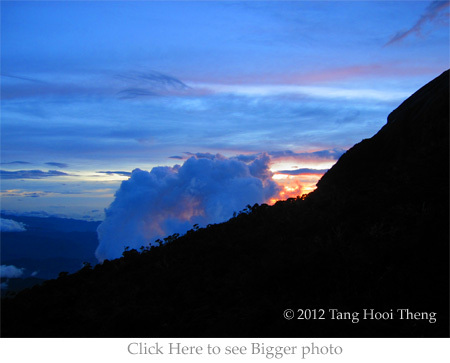 Kinabalu, the highest mountain of Malaysia. All climbers stay here for a night, before they conquer the summit next day. 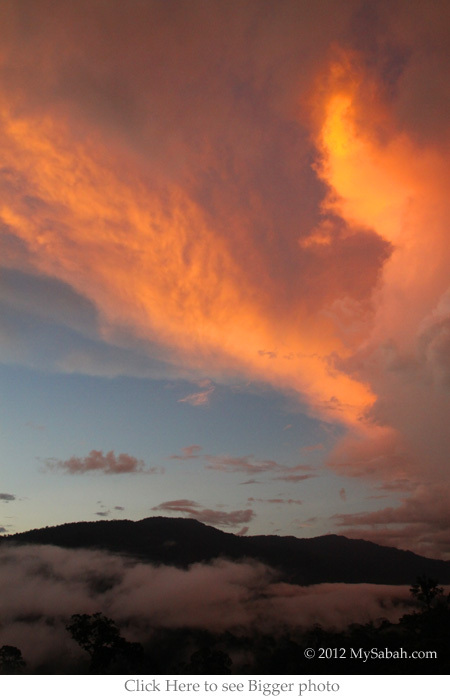 During good day, most of them will be rewarded by the sunset above the cloud, which is 3,000 Meters above sea level. 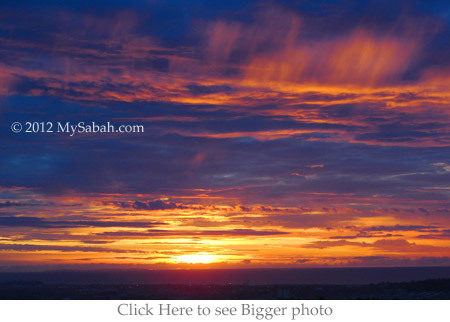 Alright, I know you can’t wait to see the BEST sunset of Sabah. 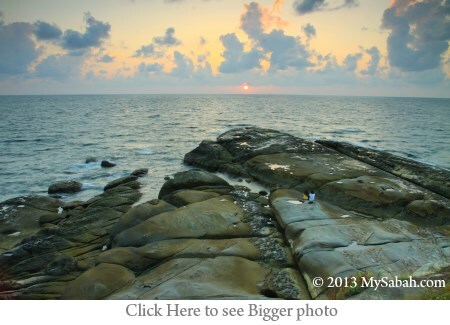 My favorite place for sunset view is Kokol Haven Resort on Kokol Hill! Kokol Hill is the highest point in KK and it is only 35 KM away from KK. After you pass by Menggatal town, just turn to junction that leads you to St. Joseph Church. Your car will zig-zag on a winding and hilly road for nearly half an hour (for 10 KM) and reach Kokol Haven Resort at 750 Meters above sea level (see Location Map). I was really surprised to find a cooling place (20°C) only 40-minute drive from warm KK city. The resort is at the edge of Crocker Range Park and surrounded by forested hills. You can see KK city from Kokol Haven Resort. There is a viewing platform with some dining tables. You can eat and drink there while enjoying the sunset view. Don’t leave right after the magic moment of sunset. 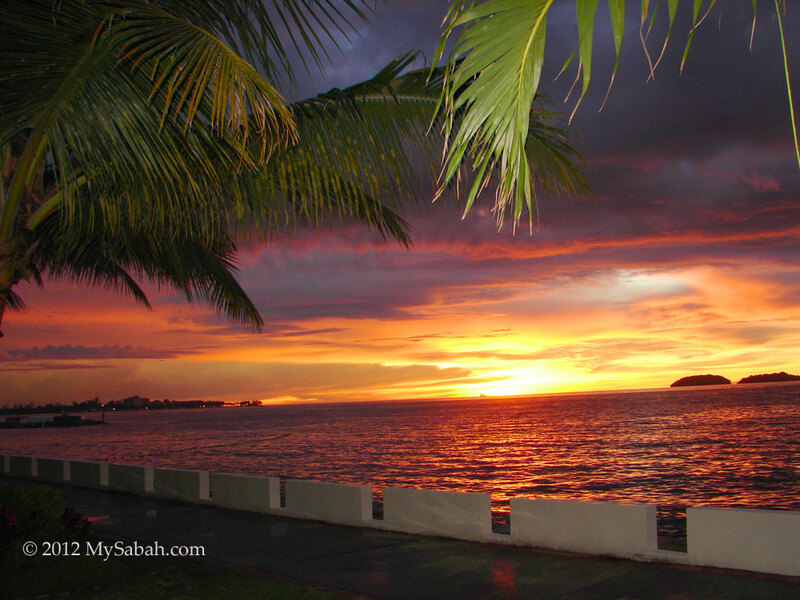 Just wait for a few more minutes to see the mesmerizing city light of KK. 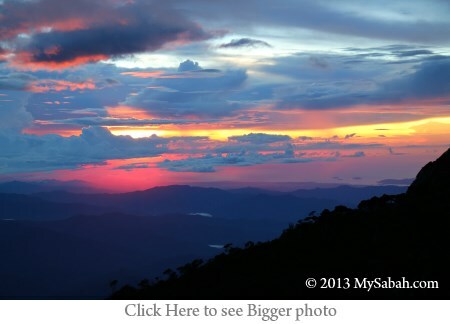 Best places to see sunset in Sabah.